Foreign chemicals and additives are an unavoidable part of almost all the foods we eat: From the pesticides and fertilisers on our crops to the preservatives and colouring agents in commercial food-processing to the plasticizers from packaging materials. But are they safe? Described collectively as “the silent threat”, the chemicals that now pervade our diets have grown enormously in the last 50 years. Disturbingly, the information about their potential health effects has not. 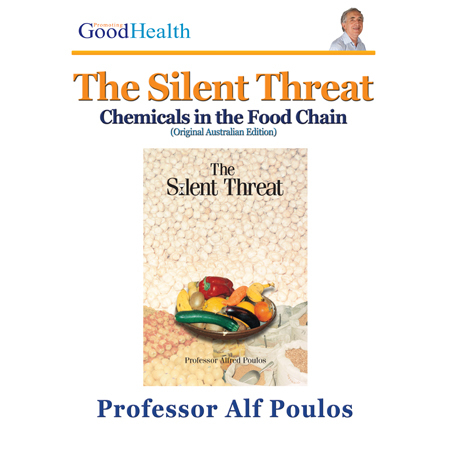 In this re-issue of the original 2005 edition of “The Silent Threat”, written for the Australian market, Professor Alf Poulos looks at the chemicals in the food chain, how they got there and assesses how safe they really are. “The Silent Threat”: Unsolicited book review by Professor Bob Douglas AO. “The Silent Threat” is a gem, which belongs on every kitchen bookshelf next to the recipe books. The author has been a medical scientist at Adelaide Women’s and Children’s Hospital for many years. He has published this book himself and has done us all a service by doing so. In nine crisp chapters and 120 pages of text, Poulos identifies the range of chemical additives and contaminants that now appear in very small amounts in the food that we buy from the supermarket. Since World War II, we have all come to depend heavily on manufactured and processed foods and they come with potential new risks to public health. While many of these risks are demonstrably minuscule, many have not been adequately assessed. And for some of them it is very difficult, if not impossible, to design the kind of study that could discover whether the contaminant levels to which millions of Australians are now exposed are causing surreptitious health damage or not. The list of chemicals which we are all ingesting is impressive. It includes pesticides, growth promoting agents, including antibiotics and hormones, traces of fertilizers, preservatives and colouring agents, chemicals released from cling-wrap packaging and the lining of food tins, by-products of disinfection of the water we drink and a number of chemicals generated during food processing. The list goes on and on and is likely to expand in coming years. Many of these substances are known to be toxic to animals in large doses. Many of these agents, when used in animal experiments at high doses cause cancer, brain damage, allergies, skin disorders and asthma. The claims in the book are buttressed by an excellent bibliography from the peer reviewed literature. The writer is neither alarmist nor emotive. The book is written in uncluttered language and each section has a plain summary which draws together the main conclusions on that topic. I am left feeling more alert and a little bit alarmed. Not that there is anything particularly ground breaking about the data he presents. I have read most of it before, but never brought together in such an accessible way. The book should serve not only as a household reference but also as a wake-up call, alerting us all to the extent and range of contaminants to which we are now exposed and which were not part of our food earlier in our lives. We are reminded that the genetically modified revolution is just around the corner as well. How can we be confident that the rising incidence of some diseases and mental disorders in childhood are not related to one or more of these contaminants. The short answer is that we can’t. So what can we do to minimize our exposure to unwanted and unnecessary chemicals? In his closing chapter, Poulos offers sensible practical advice. He recognizes that the impact of many of these chemicals on the environment is indisputable but that it is not clear-cut whether there is also any impact on human health. The author suggests that one way of knowing what it is we are eating is to return to growing more of our own food and sharing with others who do the same. He advises buying oils and salad dressings in glass bottles and avoiding where possible foods wrapped in cling-wrap. Among other useful advice he suggests that we can reduce our intake of food additives by avoiding processed foods. This book deserves wide distribution and I would recommend it to doctors, pharmacists and health food shops across the nation and to all Australians who are concerned about healthy eating. Emeritus Professor Bob Douglas AO was the Foundation Director of the National Centre for Epidemiology and Population Health, Australian National University, and is a former Dean of the University of Adelaide Medical School. For your security Promoting Good Health uses PayPal as its payment portal. To ensure the security of your credit card account PayPal may ask you to confirm some of the details for your account. Please complete all the details required on the following screens to complete your purchase.